On October 8th Earth is going to plow through a stream of dust from Comet 21P/Giacobini-Zinner, and the result could be an outburst of Draconid meteors. "We're predicting as many as 750 meteors per hour," says Bill Cooke of NASA's Meteoroid Environment Office. "The timing of the shower favors observers in the Middle East, north Africa and parts of Europe." 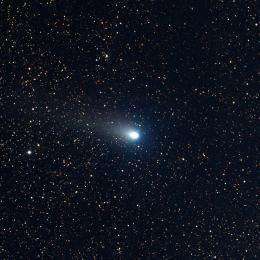 Every 6.6 years Comet Giacobini-Zinner swings through the inner solar system. With each visit, it lays down a narrow filament of dust, over time forming a network of filaments that Earth encounters every year in early October. "Most years, we pass through gaps between filaments, maybe just grazing one or two as we go by," says Cooke. "Occasionally, though, we hit one nearly head on--and the fireworks begin." 2011 could be such a year. Forecasters at NASA and elsewhere agree that Earth is heading for three or more filaments on October 8th. Multiple encounters should produce a series of variable outbursts beginning around 1600 Universal Time (noon EDT) with the strongest activity between 1900 and 2100 UT (3:00 pm  5:00 pm EDT). Forecasters aren't sure how strong the display will be, mainly because the comet had a close encounter with Jupiter in the late 1880s. At that time, the giant planet's gravitational pull altered the comet's orbit and introduced some uncertainty into the location of filaments it has shed since then. Competing models place the filaments in slightly different spots; as a result, estimated meteor rates range from dozens to hundreds per hour. Comet dust stream models suggest a succession of peaks in meteor rate between 1600 and 2100 UT on Oct. 9th. Credit: MSFC/Meteoroid Environment Office. One respected forecaster, Paul Wiegert of the University of Western Ontario, says the meteor rate could go as high as 1000 per hour -- the definition of a meteor storm. It wouldn't be the first time. Close encounters with dusty filaments produced storms of more than 10,000 Draconids per hour in 1933 and 1946 and lesser outbursts in 1985, 1998, and 2005. Meteors from Comet Giacobini-Zinner stream out of the northern constellation Draco--hence their name. Draconids are among the slowest of all meteors, hitting the atmosphere at a relatively leisurely 20 km/s. The slow pace of Draconid meteors minimizes their danger to satellites and spacecraft and makes them visually distinctive. "A Draconid gliding leisurely across the sky is a beautiful sight," says Cooke. Unfortunately, many of this year's Draconids will go unseen. Draconids are faint to begin with, and this year they have to complete with an almost-full Moon. Lunar glare will reduce the number of meteors visible from Europe, Africa and the Middle East by 2- to 10-fold. The situation is even worse in North America where the shower occurs in broad daylightcompletely obliterating the display. That isn't stopping a group1 of middle school and high school students from Bishop, California, however. They plan to observe the shower from the stratosphere where the sky is dark even at noontime. Led by Science@NASA's Tony Phillips, the 15 students have been launching helium balloons to the edge of space since May of 2011. With more than 95% of Earths atmosphere below the balloon, the sky above looks almost as black as it would from a spacecraftperfect for astronomy. "The students are going to attempt to fly one of our low-light meteor cameras in the payload of their balloon," says Cooke. "I hope they catch some Draconid fireballs for us to analyze. They could be the only ones we get." Stay tuned for results after Oct. 8th.